Different from ABEC-9, ABEC-11 bearings allow for a smoother and faster longboarding. Enkeeo drop-through longboard comes with 70mm x 51mm PU wheels, which are very fast and have a lot of traction and can withstand a lot of pressure and weight. 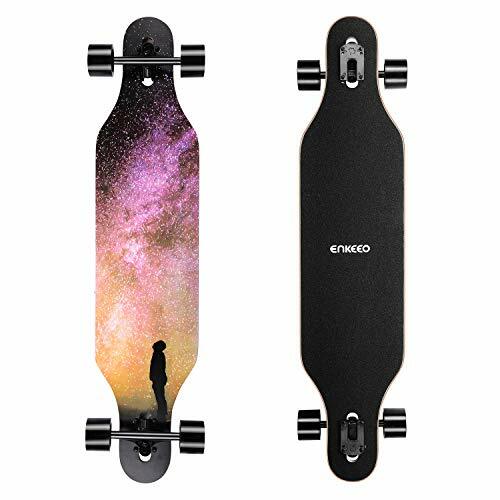 Enkeeo drop-through longboard employs a 9-ply flex laminated maple deck and its anti-slip brushed black surface brings you extraordinary performance. It's tough and durable enough for uneven surfaces, rail, pool, bumpy roads. Plus, it has a very fascinating arty design. The 7-inch aluminum trucks with 2 rubber ring as shock absorbers ensure great maneuverability and stability when it comes to downhill cruising as well as other riding styles. 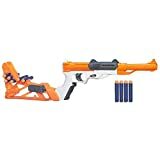 It is a master of any kind of terrain, suitable for carving, cruising, downhill racing or any tricks you can think of with its speed, balance and strength.